A new rolling bearing has been developed for wind turbine gearboxes that is not only resistant to the effects of slippage, but actually prevents slippage from occurring in the first place. Rather than using conventional rolling elements, Schaeffler’s FAG tube roller bearing incorporates three tube rollers. These tube rollers enable the bearing to rotate without slippage under all load conditions. At the same time, the load rating and rating life are unaffected. Slippage is detrimental to rolling bearings; the life and performance of a rolling bearing will suffer if it is overloaded or under-loaded. 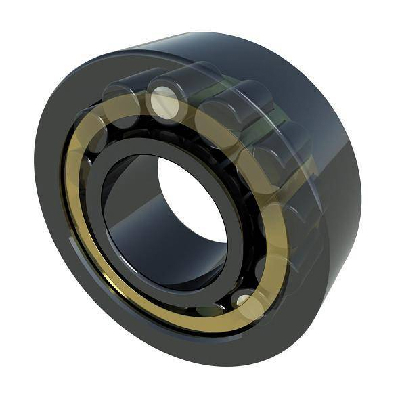 This is because rolling bearings are designed with a minimum load requirement in order to function optimally. If this minimum load is not met, slippage will occur. This means that the rolling elements not only rotate, but also slide on the bearing raceways. Eventually, this can lead to surface damage such as increased wear or smearing, particularly in critical lubrication conditions. In wind turbines, rolling bearings have to meet special performance requirements. The bearings must be designed to withstand extremely low and high loads that act on the bearing during calm or strong wind conditions. The risk of damage to a bearing increases significantly when the roller set of a rolling bearing with high slippage is suddenly subjected to extremely high acceleration forces. For this reason, Schaeffler has developed the tube roller bearing, which completely eliminates the problem of slippage. The FAG tube roller bearing is a conventional cylindrical roller bearing that incorporates three cylindrical rollers with a slightly increased diameter. These three rollers have a hollow design and are supported by a roller in the inner bore. These rollers with a slightly increased diameter generate preload in the bearing and drive the bearing cage (and therefore the entire roller set) at low loads. At higher loads, the bore of the cylindrical rollers ensures sufficient deflection of the larger rollers so that that they are not overloaded. This means that the load is evenly distributed to all the rolling elements, similar to a conventional rolling bearing. The support roller in the inner bore of the tube roller has a slight clearance to ensure that the roller is less rigid (more flexible) at higher loads. At the same time, this also prevents excessive deflection of the tube roller. Together, the tube roller and support roller provide increased fatigue strength to the bearing, which results in a rigid rolling element that withstands peak load conditions. The tube roller bearing is not available from Schaeffler’s standard catalogue but is custom designed for specific customer projects and applications. Initial prototypes have already been manufactured and tested. Pilot applications in wind turbine gearboxes are planned for the end of this year.